I wrote this a few years back, for (in)courage. But today, on Holy Saturday, when Jesus was buried and the people thought everything was over and finished and done, we can hold onto the fact that Sunday is coming. That Love is still being redeemed. I saw Jesus the day my father shaved the hair off my mother’s head. This was two years ago, back when she had cancer. Jesus was there that day, too. When my mom asked my dad if he would shave her head -- because the chemo was causing her hair to fall out and it was just too hard to pick up the pieces -- he said yes. When my mom asked my younger brother and I if we would be there when he shaved it, we said yes, too. Jesus was on her right side, my dad on her left. Eli and I stood behind. I looped my arm through his and watched. Watched the hair and tears mingle and fall together into the sink. Watched my dads hand curve gently on the small of her back. Watched love happen right there in front of me. And Jesus was there for it all. He saw every hair fall -- and since he knows how many hairs are on our head, he knows when those hairs aren’t there anymore -- and I wonder if maybe Jesus was crying, too. Love is a Groom taking the sins of his bride on his shoulders. Love is carrying her shame to Golgotha, all the way to Calvary. Love is nails hammered to bones, thorns thrusted to scalp, spear stabbed to side. Love is the Groom writhing in pain, bathed in blood, so the bride can dance free. My mom’s hair was all there in the kitchen sink. Long tears streamed steadily down my cheeks as I hugged her closely. But I witnessed love that day. Jesus holds me, holds her, holds you, and whispers: You are redeemed. 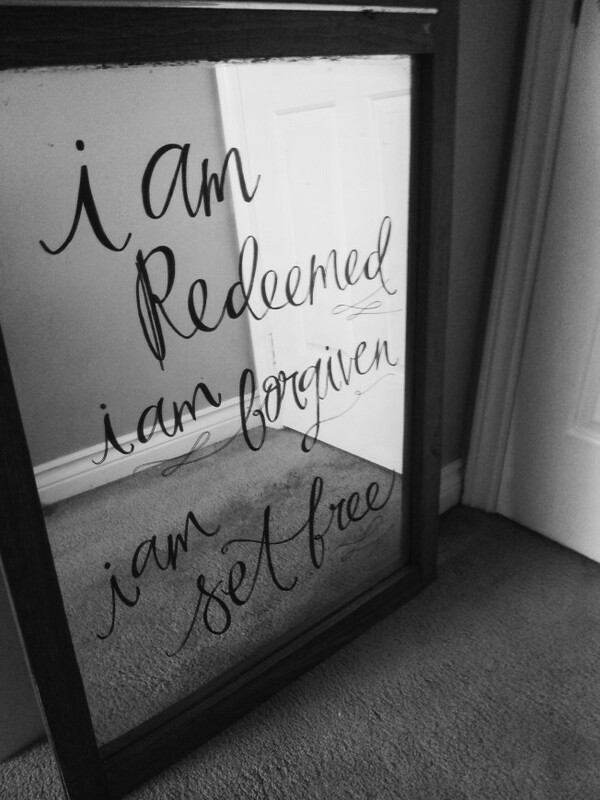 You are forgiven. You are set free. Did you hear that? Lean in closer. Let those words wash over you, like a balm on your weary, weary soul. The Groom is whispering to you – to his sweet, broken, beautiful bride. Now, we can dance free. My great friend Sarah told me she loves Valentine's Day because it's an excuse to tell someone they're loved. What a wonderful way of looking at it. I whipped up a card which I thought would make a fun free printable for you guys! And the great thing is, you can give it to anyone -- and not just on Valentine's Day either. You're absolutely, completely, totally loved. By me. By God. By a whole bunch of other people too, I'll guarantee it. The printable may go directly into your downloads without popping up on your screen, so if you don't see it right away, you may want to check there. You can find the rest of my free hand lettered printables right here. So this is it. I am going to fix you. Or at least, I want to. We are sitting across a table, and you are staring at me, telling me how you feel. You say you’re scared and ashamed and empty. You’ve run out of options and you don’t know what to do anymore. And yet to me, you are brave. I feel a sort of squeezing deep inside of my chest as you say this, and I feel scared and anxious, too. I could almost throw up I’m so nervous. Because I know after this, after you’ve courageously splayed your heart across this table, reaching out for someone to finally see you, it will be my turn. And I will need to fix you. I know that as a Christian, this is what I’m supposed to do. Naturally. Because if I am to embody Jesus, if I am to show you who Christ is, it is entirely up to me to fix you. I must leave our conversation confident that I, Aliza Naomi Latta, have defeated your demons. That I have single-handedly conquered your darkness. I must leave with absolute certainty that you are going to be okay. And if you do not leave okay, it will be solely my fault. I need to save you, or at least cover up your pain so it appears that you are mended. If your pain is too great, or your story too scary, I can rip open a band-aid and cover it up. I can place it gently on your raw, open wounds, smoothing out the edges so it’s hidden and concealed. I can wash my hands, smile at you, say, “All better,” tell you I’ll be praying, and walk away. And in my eyes, you’re healed. In my eyes, I healed you. But in my heart, I feel you’re still cracked and splintered. And I feel cracked and splintered, too. In my heart, guilt comes like a tidal wave, hissing that I have let you down, that I haven’t really saved you. In applying this quick ‘n easy band-aid fix, I have made you and your struggle into something small and insignificant, when in reality you’re crucial to this world. And this? This is the truth: I want to fix you, I feel like I’m supposed to fix you, but I can’t. It’s an impossible feat. Only the Saviour of the world can do the saving.